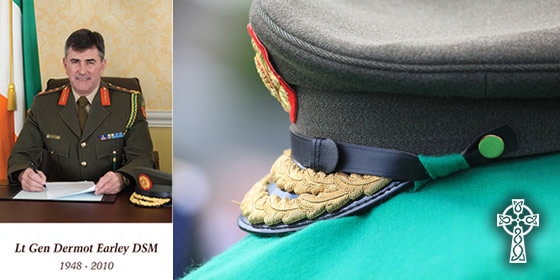 23 June 2015 marks the fifth anniversary of the untimely death of Lt Gen Dermot Earley DSM. 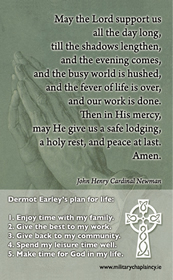 We remember a prayer for his family and his many friends in Ireland and around the world. Suaimhneas síoraí dó i nDún na bhFlaitheas. The illness and death of Dermot Earley has hit all of us with an appalling suddenness. It is so difficult to take in the reality of Dermot’s death. We feel shock and sadness, confusion and disbelief. 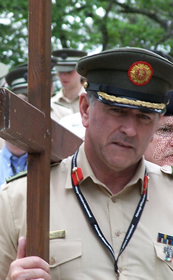 And while we seek consolation and understanding from the scripture readings read for us by Brig Gen O’Boyle and Mr. Brendan Ryan our hearts and spirits are still overwhelmed by his passing. But this morning in the celebration of the Eucharist, in this Requiem Mass, we thank God for sending Dermot Earley among us, and we pray for his family, friends, colleagues and all who mourn his passing. We have read and heard the tributes. We have cried tears of sorrow for the loss of a great leader, an outstanding sportsman and a true gentleman. Since Wednesday and the death of Dermot, the Earley family has been trying to come to terms with the loss of a loving father, a devoted husband, an outstanding brother, an exceptional son and the best uncle in the world. This is a heavy cross for the Earley family but we and thousands more are with you in your sadness. Our belief is that God does not send us crosses which will shatter our world and destroy our dreams without the strength to carry them. Thomas the apostle, who struggled with the death of his friend Jesus came to accept, but could not fully understand that Jesus overcame death. This is our hope. This is what we are celebrating today. That straightness, that honesty of the centurion were also the hallmarks of DermotEarley. He was fair, firm and friendly. Dermot Earley was a good man, in fact he was a great man, but to the people of Roscommon he was a MIGHTY MAN. Mighty to his family, his friends, the Defence Forces, the Gaelic Athletic Association, mighty to everyone. Dermot had a philosophy or a Plan for Life. You will find it on the wee Prayer Card. We are all privileged to have known Dermot Earley, some are fortunate to have served with him; his family is blessed to be part of him. We think of you, his wonderful family, in a very special way this morning as you mourn the loss of a hero. It is once in a lifetime you meet a person like Dermot Earley. So today we might do well to consider HIS plan for life. If we live according to Dermot’s rule we won’t go far wrong. • Your attitude is more important than your ability. • Your motives are more important than your methods. • Have your heart in the right place. His service is this life is now completed. Dermot Earley, may you Rest In Peace. Amen.